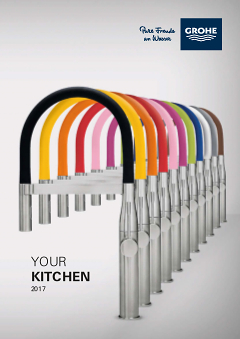 The GROHE Essence kitchen tap is the ideal solution for kitchens where performance and versatility are in demand. It has been designed with an elegantly understated exterior that will give your kitchen a timeless look. The tap turns through 360? for maximum flexibility w the solid metal pull-out comfort shower head has two options – a standard spray and powerful jet spray – that can be switched between with just the push of a button. It’s perfect for achieving a multitude of kitchen tasks with ease, from filling pots to washing vegetables, and cleaning up afterwards. It also extends across the width of a double sink. When you are finished the GROHE EasyDock system also means that the spray head retracts easily back into place. This monobloc mixer contains GROHE SilkMove technology to ensure smooth, accurate water and temperature control for years. Plus the sparkling GROHE StarLight chrome finish is scratch-resistant for a dazzling surface designed to last. Whether rinsing vegetables, cleaning the basin or filling pots, the metal pull-out comfort shower head maximizes your work space and convenience. The dual spray diverter under the shower head makes it easy to switch between a fine spray jet and a powerful shower jet. The GROHE EasyDock system has a Glideflex low-friction hose and lead counterweight that ensure the shower head retracts smoothly into the spout. Thanks to this technology, the tap is also super easy to install.